Don Bauder never bought the death threats and libel suits. But at 82, arguably the most ferocious reporter in San Diego history is finally paying heed to a warning: chest pains. “My heart is telling me to jettison my love/addiction” for investigative journalism, he wrote literally. On Monday, three weeks after announcing his retirement as a columnist for the San Diego Reader, Bauder will take a two-hour trip from his mountain home in Salida, Colorado, to Colorado Springs for an angiogram. Blood flow is insufficient, says Bauder, a veteran of two quadruple-bypasses. Nothing can impede the flow of tributes, however. His former colleagues at The San Diego Union-Tribune are unanimous in praise of his career here, starting as a $18,000-a-year business editor in 1973. Dean Calbreath, who helped the U-T win a Pulitzer Prize for Rep. “Duke” Cunningham coverage, said it was wonderful to watch Bauder track down a scam artist. 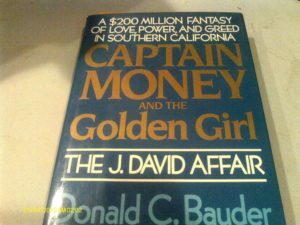 His vast body of work includes a book on the notorious San Diego Ponzi-couple J. David Dominelli and Nancy Hoover — “Captain Money and the Golden Girl,” excerpted in the Reader, and hundreds of smaller stories that led to jail terms or heartburn for San Diego corporate titans and office-holders. He railed against corporate welfare, especially that benefiting the San Diego Chargers and its Mission Valley stadium deals. “There was a period at the Union when he produced more stories than anyone at the paper, helped any colleague who needed it and then raced off to do regular television commentary, at which he was similarly superb,” Rose said. Slaying sacred cows — even for U-T management — was his specialty. U-T Editor Karin Winner killed ballpark-subsidy stories. That he wasn’t fired before his 2003 U-T retirement is a marvel. His colleagues have theories on that. 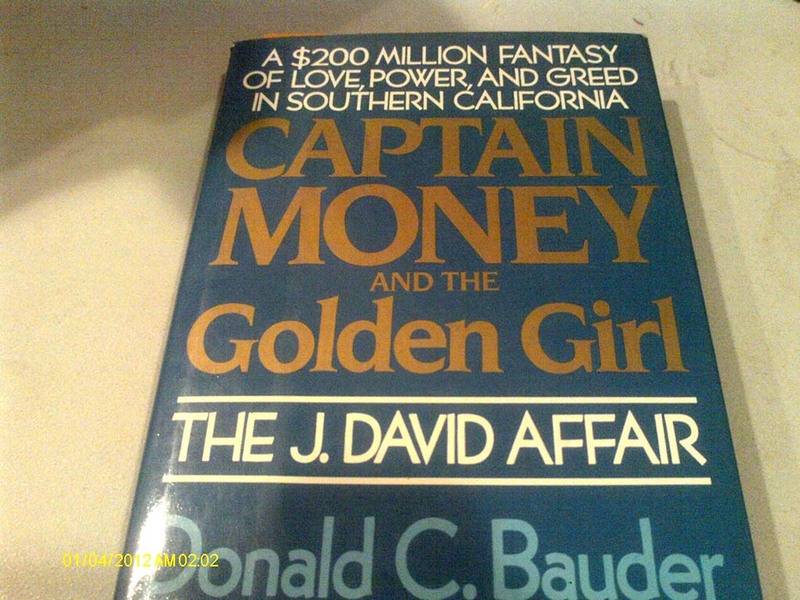 Don Bauder became the story himself at times in the San Diego Reader. He made himself a celebrity. Bauder won fans (and sources) because he was consistently ethical and approachable, she said. 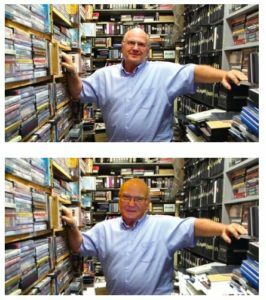 In the third-floor newsroom of the old Mission Valley building, where he had an office packed with overflowing bookshelves, Bauder was beloved for his chivalry and thoughtfulness. Bauder read his staff’s stories, Young said, and hand-wrote notes to individual staff members telling them what made their stories good. “At the end of a workday, as I was heading out, he thanked me, every day,” she said. Five years ago, Bauder’s head was Photoshopped atop a Kensington Video staffer’s body in the San Diego Reader. She said Bauder — also devoted to his own family — would always ask her about her children and what they were up to. And he was great fun to work with, she said. “When he ate, he always had a series of napkins down his shirt to protect from spills,” Krier said. 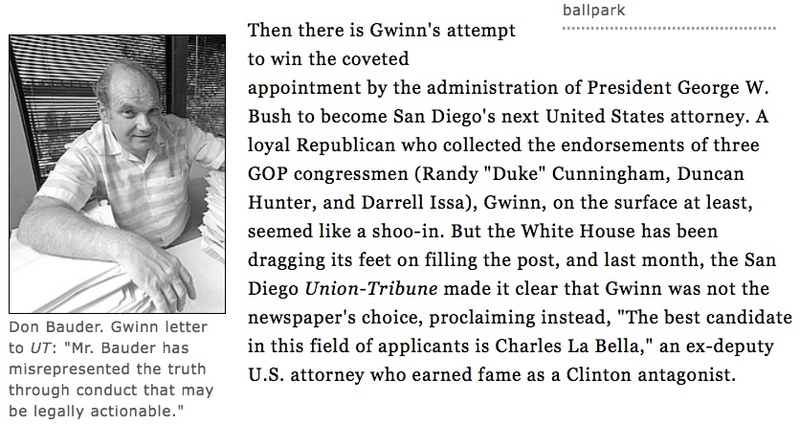 But Bauder was never afraid to spill the beans, going back to his days at Business Week magazine, where he worked nine years (mostly in Cleveland) before coming to San Diego. 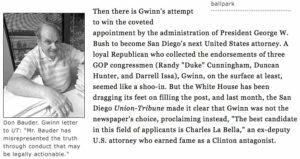 Calbreath, retired from The San Diego Daily Transcript, said Bauder had an ability to smell the truth beneath PR statements. Bauder’s skepticism was infectious. So Rose echoed it. In fact, his last Reader column — “A curmudgeon’s view of debt: Why not enact the Robin Hood tax?” — ran nine days after the retirement announcement. Raised in a Chicago suburb, Bauder attended the University of Wisconsin, where he earned a bachelor’s in business and a master’s in journalism. Possibly because his father was a stockbroker and brother did advertising, Bauder went into advertising and public relations for four years in Chicago. And then strangely (because of his background) came Business Week, working first in Chicago and moving with his family to Cleveland in 1966. 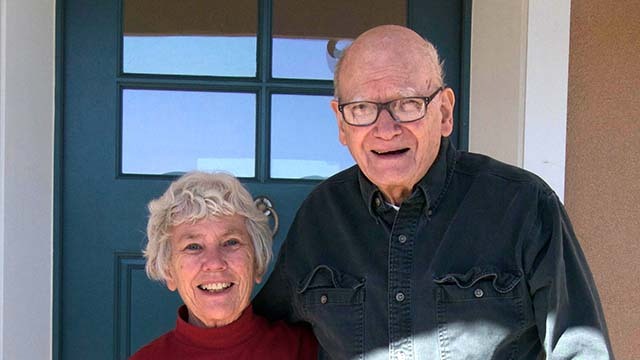 His wife of 56 years, Ellen, has a doctorate in plant ecology from UC Davis. It's just a rumor, but worth reporting: Don Bauder is a centaur. Who knows if it's true; neither the Reader nor Bauder responded. Their sons Russell, 48, and Clinton, 51, are Bay Area “techies” working at Oracle and Apple, respectively. Bauder has two grandsons via Russell. The Bauders live in a 4,100-square-foot home finished in 2003 on 36 acres. Bauder was interviewed via email. Times of San Diego: When did you move to Salida, and why? Personal security? Rural serenity? Don Bauder: We moved to Salida in March of 2003. I retired from U-T just before the move, at age 66, after 30 years. Ellen has a Ph.D. in plant ecology from Davis. She is an expert in vernal pools. She was heartbroken as developers cemented over the vernal pool sites in San Diego. She wanted to get out. Beginning in 1982, we went to Santa Fe every summer for opera. Her cousin and husband had retired to Salida. They suggested we come up after one of our Santa Fe visits. We had planned to retire to Santa Fe, but it became far too congested as restaurant prices soared. So we were ready for another retirement spot. We fell in love with Salida and environs and changed our plans to build a home in Salida. We bought the land in 1999 and started the house in 2002. We are on 36 acres with 14,000-foot peaks in three directions. Also, Salida has plenty of culture, which I will get into below. We had lived in large cities our whole lives — raised in Chicago suburbs, lived in Cleveland seven years, San Diego 30 years. Salida has population of around 5,000; county is about 17,000. We love the small-town aspect. What’s your prognosis? Made a decision on further heart surgery? What hospital group, HMO or doctor is advising you? I had no heart attack before the 1990 quadruple bypass, but I was having serious chest pains and shortness of breath. Medical explanation is that mammary artery was not used in 1981. Leg veins were not sufficient. Other people who had had bypass in the 1980 period were having second operations. Various cardiologists from Colorado Springs Cardiology come to Salida, and I go to whoever is scheduled. … What bothers me is that my chest pains and shortness of breath are the same as they were in 1990. I have discussed that with a cardiologist and he suspects that grafts from previous surgeries may be getting clogged. That sounds logical to me. Is living at elevation good for your heart? Considering a move to lower elevation? Some suggest that I should not live at 7,400 feet, but I think it is a matter of adjustment. San Diego cardiologist was telling me it was fine to hike at 7,500 or 14,000 feet in Colorado if I got accustomed to it in a day or two. If I am told we have to move, that will be a disaster. Other than your heart issues, what shape are you in? What kind of exercise do you get? I used to do a lot of walking, but of course can’t do that now. I had an almost fatal case of the flu in 2015 and began lifting weights after I got over that. But I am doing no exercise until I find out what is wrong. My father lived to 78 and died of a stroke, as his father had. My older brother only made it to 78 and died of a stroke, combined with a heart attack. Obviously, I am vulnerable to heart and stroke problems. Do any volunteering? Speak to local journalism students? Oh, yes. For 12 years, I was on the board of Salida Aspen Concerts. Aspen Music Festival and School puts on six concerts a year in Salida. My duties gradually rose until the last couple of years, I was doing the fundraising, advertising and marketing, publicity and writing and editing the program book. That was too much and, combined with work for the Reader, may have contributed to my current condition. I resigned from that early this year. I loved writing the news releases and program book inserts because, of course, I love classical music. What’s your local paper? Consider writing for it? The local paper is the Mountain Mail. When I wrote for Salida Aspen Concerts, I wrote regularly for the Mountain Mail and a paper in Buena Vista, owned by the Mountain Mail owner. Of course, my news releases went all over the West. Ever get recruited to write for The New York Times, Washington Post or another major investigative outfit? Never was recruited by Times, Post or other paper. Of course, I had written for Business Week and the U-T before joining the Reader. I have been quoted in the Times. One of its columnists claims he reads me all the time, but I was only quoted once, as far as I know. Besides “Fear,” what books are on your to-read list? Only “Fear” is on the list now, but there is supposedly one coming named “The Apprentice” that deals with the same malignant psychotic narcissism. I have a copy of Seth Hettena’s “Trump/Russia” and have read [former FBI Director James] Comey’s “Higher Loyalty,” Isikoff/Corn’s “Russian Roulette,” Jonathan Keates’ “Handel: the Man and His Music” (my wife and I are fanatics of Handel operas and other works and I am listening to “Semele” right now). Did you coin the phrase “Scam Diego”? People give me credit for inventing “Scam Diego,” but I can’t imagine somebody hadn’t thought of it before I used it around the time of the Dominelli Ponzi (1980s). You once wrote: “I continue to own New York Times stock (only 200 shares) even though I have a big loss in it and the dividend has been slashed. I own it because I think that if any publication can make the transition from paper to the web, it’s the Times. It has become the national newspaper for intellectuals. Admittedly, a metro daily in a community like San Diego is different.” What major stocks or funds do you own now? How are they doing? I fumbled on New York Times. I bought it because I thought it would figure out how to make money on the Internet. I bought around $16, and after dividend was cut dumped it around $10 for a loss. Bad boy. It has jumped into the $20s. Trump controversies have helped. I haven’t followed its finances, so I don’t know if it has figured out making money on the Internet. I buy only individual stocks. I buy greatly for dividend yield. That means I don’t get in on hot high techs. I buy aged blue chips with good dividends but not likely to rise much in price, except as they are carried by the market. Recent buys: General Mills, Campbell Soup after it dropped 11 percent in one day, Kraft-Heinz. I own more than 1,000 shares of Procter & Gamble — an aging blue chip with solid brands. I am loaded up on utilities, which have lagged in recent markets. I have a bunch of high-yielding blue chip oils such as Royal Dutch. I took a beating on those, but they have bounced back. I am the only one you know hoping gasoline prices would rise. I was outperforming the S&P 500 for several years after the crash, but now I am lagging as the market has turned speculative. That’s not a game I play. I am happy going up slowly or sideways with a blue chip yielding 4 percent or more. You call your Reader years the highlight of your career. Why? 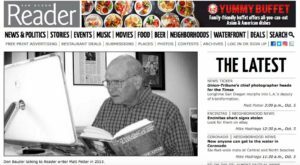 The Reader was the highlight because [founder and editor] Jim Holman encouraged tough reporting, particularly about La Jolla and Rancho Santa Fe. I took joy in exposing Rancho Santa Fe crooks, and there are plenty there. After such a column for the U-T, I would get a note from Herb Klein, saying he had almost lost his breakfast reading the column. I think he would take those columns to Helen Copley. He took several to her. One time, I was sitting next to Bruce Henderson at a debate on the stadium subsidy. That wound up with me getting a week without pay, and a letter from Karin Winner that was so illogical, disjointed and anti-journalism that I didn’t know whether to laugh or cry. Helen had supported me because Charlie Ross and I had worked with Maureen O’Connor to thwart Edison’s attempted takeover of San Diego Gas & Electric in late 1980s-early 1990s. Helen was strongly against that takeover, and appreciated the work we had done. But when the stadium/ballpark subsidy issues came along, and I opposed the subsidy, she turned cool. Klein was trying to get me fired over those two issues (Padres and Chargers subsidies). I don’t know why he didn’t succeed. I think cooler heads prevailed — probably [U-T lawyer] Hal Fuson’s wise counsel. How many of your story subjects have been put behind bars in the wake of your reporting? Biggest names? Oh goodness. Dozens of people I wrote about subsequently landed in the hoosegow. Of course, Dominelli and Hoover did, but I can’t take credit for that. And I don’t know how many that I believed I had exposed had already come to the attention of law enforcement. Recently, a lawyer named J. Douglass Jennings Jr. was disbarred and went to prison, and I think I nailed him before the authorities did, although a bankruptcy judge had fingered him about the time I was discovering him. You’ve been sued for libel several times, including by Charles Givens in 1994 and Robert Bell in 2001. What were those cases about? How did they get resolved? No libel suit against me ever got to court or was settled. All went nowhere. Givens was a Florida promoter who sued any journalist who mentioned him. We backed him down. I don’t know who Robert Bell is. I was sued by one guy who sued the judges in the district at the same time, including those on the state Supreme Court. He wound up in the pokey. Tell me about the death threats. 2. Another cellmate of a guy in San Diego jail who told me his cellmate planned to throw sulfuric acid in my eyes once he got out of jail. 3. I got an anonymous letter from someone who claimed to have overheard two guys running a multi-level marketing outfit I had been slamming talking about throwing sulfuric acid in my eyes. 4. One day my supervisor, Steve Prosinski, told me that the U-T had received a threat letter. It was from someone purporting to be a secretary at a local company who knew of a death plot. There was no identification of the company. 5. One day somebody called me and said, “I will kill you.” At this time, [former San Diego Police Chief and Sheriff] Bill Kolender was working for the U-T. I called Bill and he called the police, which said nothing could be done. I don’t remember any threat that included Helen Copley, but Sandy [Young] has a much better memory than I have. I never got any threats while at the Reader. The stories that provoked the threats were stories about local con artists — penny stock touts, pump-and-dump fraudsters, multi-level marketing fraudsters, ad nauseam. Nobody big. How did you manage to do so much remote research from Colorado? Did Matt Potter or someone else make visits to court for records searches on your behalf? Matt Potter and I worked together closely, but he didn’t get suits for me. We had a staff member who regularly visited the courts and fetched suits for me and for others. I had a number of sources — many anonymous — who sent me lawsuits and appellate court decisions. Also, I could get a lot of them online through, for instance, Pacer. I could go online and find out whether rascals were in prison or in jail locally. With your absence, local institutional knowledge is gone. Who in San Diego could step up to take your place? Who can tackle the finance-related stories you were expert on? Matt Potter has plenty of institutional knowledge and is an excellent bird-dog. There are others who send in items to the Reader who know plenty. You once said “Captain Money and the Golden Girl” had Hollywood potential but no nibbles. Still think someone should make a movie? You were famed for interacting with readers via comments on your stories, with one (“No More Bragging Rights” about the San Diego City Employees’ Retirement System in 2008) getting 1,310 comments. Why did you respond so often? Who were your biggest foils or friends? Did you know the IDs behind the pseudonyms, like Visduh and JustWondering? I could not check the names behind the pseudonyms, but knew who they were if they volunteered their names. One came to Salida to have breakfast with me. We correspond separately, and did back when I worked on the U-T.
What stories have you had in the pipeline that you regret not being able to finish? Business Week was often killing tough stories of mine. Karin Winner killed five or six columns about the ballpark and stadium subsidies. You’ve done hundreds of lawsuit stories. What proportion of them did you follow to resolution? Do the U-T and other local media do an adequate job tying up loose ends? One of my weaknesses is doing items (usually blog items) about lawsuits and then never following through. Mea maxima culpa. I don’t know how well the U-T and other media do following through. You’ve written a lot about the San Diego Convention Center, Mission Valley stadium issues, for-profit colleges and the city’s pension crisis. Did your reporting influence decision-makers on any of these (or ones I haven’t mentioned)? If so, how? If my views on the convention center expansion and the sports stadia subsidies influenced the establishment, it was in the opposite direction. My opposition to corporate welfare expenditures may have influenced the downtown plutocrats to dig in their heels and work harder for the fatuous spending. Possibly my exposés on for-profit colleges may have swayed some about Bridgepoint, but I doubt that. I certainly didn’t move any needles on the pension crisis, which may well be an issue again before too long. You’ve followed every twist and turn of U-T ownership and circulation/revenue decline. What are your predictions for the U-T under new owner Patrick Soon-Shiong? How long will the print edition last? Yes, I have followed the stark decline of U-T circulation. 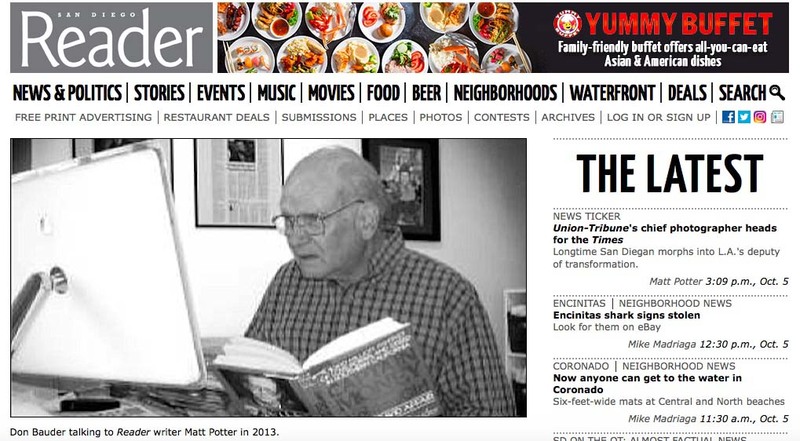 I think the U-T has a couple of more generations to go, although, as I have revealed, circulation is utterly plummeting. (Get out the blog from last October.) Matt Potter is doing a yeoman job following Tronc and the new owner. I will tell you one thing: McClatchy is not going to buy Tronc. It has an astonishing debt load. How do you rate other investigative outlets in town? Whose work do you admire most: Voice of San Diego, iNewsource, San Diego CityBeat or some other online or broadcast outlet? I think you folks at Times of San Diego are doing a good job. I thought the same of Voice of San Diego, but several weeks ago I discovered I hadn’t received the publication for several months. So I must not have missed it. I don’t read CityBeat. I haven’t seen a San Diego TV programs for 15 years, although I did look at the U-T’s pathetic TV attempt for laughs back when Manchester and Lynch took over. How will the Trump presidency end? What do you expect Robert Mueller to find? I expect Mueller to find that Trump and his staff cooperated with the Russian attempt to influence the 2016 election — sadly successful. I suspect Mueller will come up with enough for there to be criminal charges against Trump, but I can’t predict what will happen. What’s your advice to prospective journalists? What should students study? How could they fill your shoes? Funny you asked. In 1992, I went back to Wisconsin to accept an award from the J-School. I predicted there would be big problems in the print media. The next year I got a one-week fellowship there and repeated the warning. I would be hesitant telling a student to study print media, with the exception of social media. Although I did a lot of TV in San Diego, I am not qualified to tell students whether to go into it. Your first Reader column said: “The meek have not yet inherited the earth, but the nerds have taken over the world’s financial system. Without meaningful reforms, the meek should refuse their inheritance, according to a superb new book, ‘Infectious Greed: How Deceit and Risk Corrupted the Financial Markets,’ by Frank Partnoy,” a law professor who moved from San Diego to UC Berkeley. Things have not improved. Stocks have gone up, but that’s because after 2008, the Fed kept interest rates at zero for so long and still haven’t brought them back up sufficiently. This pumps up stocks, but people in the middle class bring home less now than they did in 1980, adjusted for inflation. In 2014, you wrote: “I agree that San Diegans are perennially uninformed. The press is greatly to blame, but not wholly. San Diegans themselves don’t want to hear the truth; they are willing to let their pockets be picked as long as the sun shines.” Still true? The reason is that so many San Diegans come to the city to play. They enjoy golf and beaches but don’t take part in civic activities. So their pockets get picked. Why do you think crooks steal the citizenry blind and bandits are attracted to San Diego?